The Compulsive Reader: Emma Carlson Berne and Still Waters! 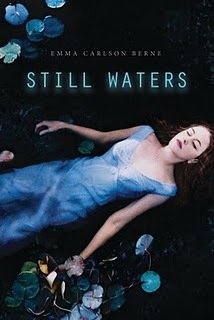 Emma Carlson Berne is the author of Still Waters, which I reviewed earlier this month here. It's a great romantic thriller that you can easily get lost in, and it's out on Tuesday! So while it might be a little late to add it to your Christmas list, it will definitely be out and ready for gift card spending! To celebrate the release, Emma was kind enough to answer a few of my questions about writing and her next book! TCR: What inspired the lake house setting in Still Waters? ECB: Well, I’ve always been very drawn to nature. We spent a lot of time camping in Kentucky and in the Rockies when I was growing up. One of the main family activities as a child was walking in the woods. Looking at grasses, different kinds of berries, picking up interesting stones—these things always come naturally to me. So it’s easy for me to envision all sorts of stories set in striking natural environments. When I was about eighteen, I drove north with my friend to visit her family’s lakeside home in Michigan. This place was all piney woods, creaky screen doors and musty couch cushions. I loved it—making jam with her grandmother, going for walks to the old cemetery (sound familiar? ), sunbathing in the rowboat on the lake—yes, there was a rowboat too. I didn’t really expect the trip to make any lasting impressions, but when I poked around in my brain for compelling settings for the story, up floated the old lake house. TCR: What is it that draws you to writing thrillers? ECB: I’m basically just a macabre person at heart. Seriously, in seventh grade, when we all had to do a social studies report on an important world event, I chose the Black Death. I’m a lifelong Stephen King fan and one of my favorite artists is the cartoonist Edward Gorey, who does intricate, creepy little drawings set in the Edwardian age. One of my favorite movies of all time is the Blair Witch Project (I still haven’t gotten up the nerve to watch Paranormal Activity, though. I think I might have to see it at like ten am on a weekday morning or something.) It’s all pretty funny because I’m actually the cheerful suburban mom of a toddler. Writing lets me indulge my darker side. TCR: What was the hardest part about writing Still Waters? The easiest? ECB: Oy, the hardest. Probably the agonizing hours and hours and HOURS of drafting. Just pulling the story out by brute force, even when the last thing in the world I wanted to do was plant my rear down at that desk and write. I had days when I hated every word I wrote. These aren’t uncommon for me and they don’t always mean I actually wrote bad stuff that day. Drafting is absolutely my least favorite part of writing, even though it feels sort of bad to say that. Lots of writers just love it, but I’ll take revisions over drafting any day. The easiest part was surprisingly, conceiving of the idea and selling it to my editor. Usually this is also agonizing and requires a huge amount of work, back and forth, rejecting of ideas, revising of ideas (in my case, at least). But for this one, the gods were smiling on me—I thought, “hey, what about a book about this?” My agent said, “Good idea!” He showed it to a few editors, one of whom said, “I like it!” And just like that, the book was sold. It was a nice experience and since I’m a fatalist, I’m convinced it’ll never happen again. ECB: Yes! CLOSER (which may soon have a new title), will be out in Fall 2012. It’s a pretty dark story about a twisted love triangle, and is set on a small farm in rural Ohio. This one’s a tad more violent than STILL WATERS, and—I think—a whole lot of fun. TCR: What books have you enjoyed reading recently? ECB: Well, since I’m a huge nerd, I just loved A Time Traveler’s Guide to Medieval England by Ian Mortimer—all about everything people ate, wore, listened to, etc. back in the fourteenth century. I passed it on to my mom, since we usually like the same books. And I also recently read Before I Go to Sleep by S. J. Watson, which was a fantastically creepy thriller about memory—a subject I’m pretty interested in. And actually right now, I’m in the middle of my one hundred millionth re-reading of Little Women. How can I stay away? I have to read it at least twice a year. Be sure to pick up Still Waters when it comes out next week! Fun interview! And YES, a kindred spirit--I also chose to do a presentation on the black death back in elementary school. Everyone else did castles or the feudal system, and I used my Barbies to show dead bodies piling up in the streets! Yeah...not really surprising I like good suspense and horror novels as an adult.